Yes, this is an attack against the police. This is an attack against the state power that the police represent. This is an attack against a regulatory power that for many people means daily humiliation, violence and exclusion. In Offenbach, many people hate the police. 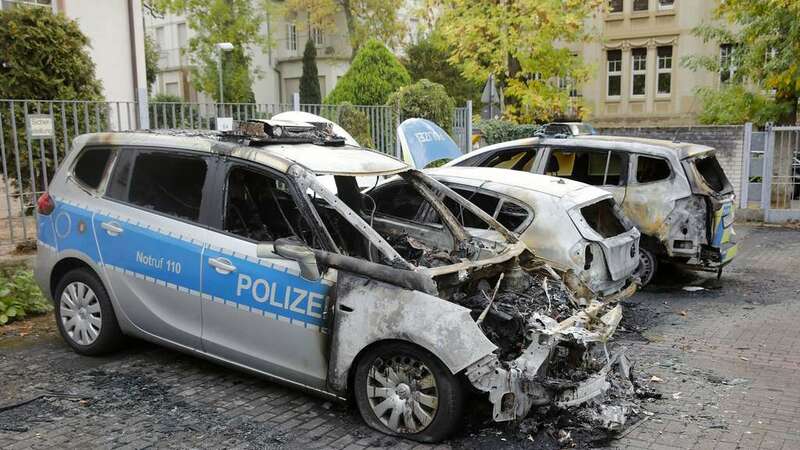 On the night of the 13th to the 14th of September 2018 we torched some cop cars in the parking lot of the cop station in Offenbach am Main. The best way to explain what we do is that everyone can understand the image of burning cop cars. In Offenbach, many people hate the police. You hang around the Main, a cop car drives past slowly. It stops. Two cops get out. “Papers!” If you do not have them, they take you with them. If you ask why you are being ID controlled, they take you with them. If you ask why the whole thing is happening and refuse to get in the car, you will feel a well-trained pain grip. Resisting Enforcement Officers. Maximum term of imprisonment: 3 years! Why and what should be done, you still do not know. You’re having a party – they come running in with a big group, pouncing on people and spraying pepper spray. You run through the city – they control you, bully you in public, insult you, arrest you. You do not have to look far in Offenbach to find large numbers of people who can tell you these stories. Cop violence is not the actions of a small minority who are out of line. It is the result of a deliberate system based on a violent state monopoly, which provides security for itself and its property. We expect that the same screaming heads will excite themselves over this attack as always, with incomprehension, shaking their heads with disbelief at this action. On the other hand, incredibly, we find a society that is silent. A society that exploits, criminalizes, restricts and excludes, merely to retain its own status, one’s own little privilege. Silence as big steps are made towards a police state. About a year ago it was the cops who enforced the internet platform linksunten.inydmedia.org to be taken offline. With completely absurd legal fabrications a large project of long-term independent reporting was destroyed and along with it the possibility of the free expression of opinion. The authorities have already understood that the new field of social oppression is on the Internet. Here, unpleasant information must be controlled and banished. Here, access to non-compliant content must me made as difficult as possible. For many, the battle for the consciousness of all those who are smartphone-obsessed may have long since been lost. For the police, it’s only just beginning. It was the cops who arrested four people here in Offenbach and Frankfurt at the end of June because they allegedly participated in protests against the Hamburg G20 summit in 2017. It was the cops who killed Oury Jalloh. It was the cops who killed Halim Dener. It was the cops who killed Christy Schwundeck. There are cops invading the Hambacher Forest near Cologne. Here they are criminalizing legitimate protest against Europe’s largest opencast lignite mine, from which only the energy giant RWE profits. Cops injure people, destroy the environment and forcibly evict people’s homes. There are cops that are increasingly influencing the media landscape. They strive to control the narrative by posting questionable and false messages via social media channels, which are immediately disseminated without question by mainstream media. There are cops who arrest people to deport them, often to face incarceration torture and death. that will forbid you to contact me. We will not wait until more of us are arrested, deported or traumatized by daily racial profiling. Greetings to the comrades in Hambacher Forest and in the prisons! Hold on! Freedom arises as a fighting movement! This entry was posted on Saturday, September 22nd, 2018 at 11:07 am	and is filed under Direct Action.